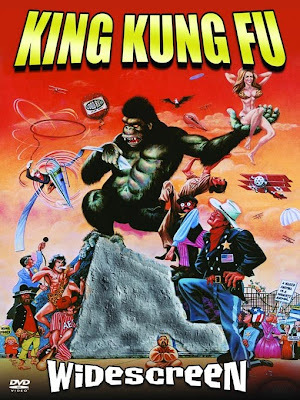 Plot Synopsis: This is the unforgettable story of a Chinese gorilla who knew karate. Raised as a lifelong house pet of Alfunku, a Chinese karate Master, the gorilla uses Kung Fu to attack and defeat the master during a lesson. Embarrassed, the master gives him to the United States as a friendly gesture where he is displayed in Wichita, Kansas. As a publicity stunt, the gorilla, King Kung Fu, is set free and the police captain J.W. Duke (bearing a resemblance to a certain famous Western movie star) and his first officer, Pilgrim, get involved in an extensive chase to recover him and rescue his love interest, Rae Fay. The comedy and suspense continues until the girl and the gorilla end up on the tallest building in Wichita, the Holiday Inn. Full of clichés, spoofs and a cast of memorable characters the whole family will love!